Since 2001, Yoshimi Hayakawa, 48, from Toyota in Aichi Prefecture, has been living in Galway, a small and vibrant city on Ireland’s Atlantic coast. After studying Chinese in Kunming, China, for five years, then traveling around Southeast Asia and spending three years in Hong Kong working for Yamato Transport Co., Ltd., a Japanese logistics company, Hayakawa made the move to Ireland to study English. Her plan was to spend a couple of months at a language school in Galway, and then set off on a grand European tour just as the continent was getting used to a grand monetary experiment: the euro. Hayakawa got to grips with the new euro, but she never left Galway. Seventeen years on and she’s still there. And now she’s about to embark on her next project: “Galwaymae-zushi,” as she calls it, or bite size sushi made from the bountiful supply of fish from the harbor, a stone’s throw from her cafe. But first, she’s returned to her homeland. Since January, Hayakawa has been enrolled on a four-month sushi training course in Nagoya. 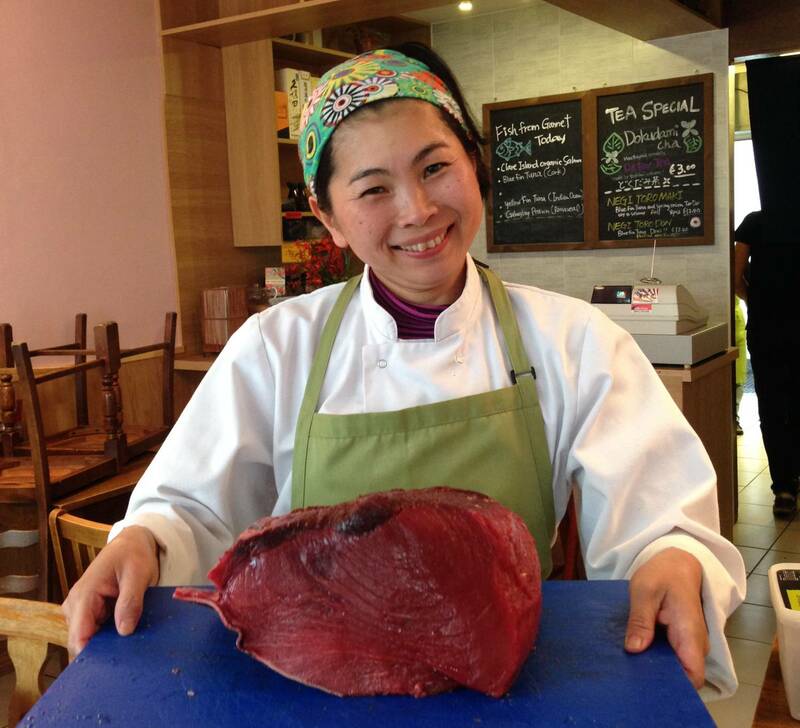 Meanwhile, in Galway, she’s given free rein to her chefs at Wa Cafe, the sushi eatery that she opened in 2008. “They’re making ‘culchie’ ramen, while I’m away” Hayakawa says when we meet in Kyoto. There’s a lot of cabbage in it, she says, laughing at the pairing of ‘culchie’ a colloquial term for “country person” and ramen, one of Japan’s most well-known and best loved foods. Hayakawa never intended to become a chef or open a cafe, or even run her own business but, she says, she’s always been willing to “go through the doors” as life presents them. It was her host family in Galway that inspired Hayakawa to take up cooking. Her host mother encouraged her to make Japanese staples such as maki-zushi (sushi rolls), tempura and miso soup, which Hayakawa discovered she enjoyed serving at small gatherings of her new friends. “Back then, the only thing Japanese I could find was Kikkoman soy sauce,” Hayakawa says, so she had to learn to improvise. But her hosts loved her cooking and Hayakawa realized that she was on to something. “One month into my homestay and I started to say, ‘I want to have a Japanese restaurant here in Galway,'” Hayakawa recalls. Though she was half joking at the time, she credits her friends for encouraging her and the entrepreneurial spirit of her adopted city for pushing her to realize the dream. Her first break in the city came via a fellow entrepreneur, Seamus Sheridan. A cheesemonger with a lot at the Saturday market in the city center, Sheridan offered her a free space next to his stall and gave her use of his kitchen to prepare the maki-zushi rolls to sell. Every Saturday she would prepare a few hundred rolls, which she sold alongside Sheridan’s Coolea and Gubbeen smoked cheeses. More than 16 years on, Hayakawa still goes to the weekend market laden with maki-zushi to sell side by side with the cheesemonger. From those humble but successful beginnings, she was prompted to open a sushi bar by her friends. Hayakawa, however, was reluctant, being well aware that in Japan the art of nigiri-zushi (hand-pressed sushi) required years of training. 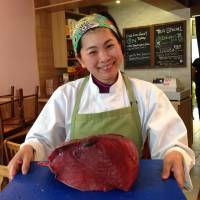 Nevertheless, in 2005 Hayakawa and a Japanese partner co-opened Kappa-ya — the first Japanese restaurant in Galway. Kappa-ya is still there, but Hayakawa left in 2007 to open Wa Cafe on Aug. 8, 2008. “Eight is a lucky number,” Hayakawa says. It was on the final day of a training course at the Tokyo Sushi Academy that the Great East Japan Earthquake and tsunami of 2011 struck Tohoku. Hayakawa was due to fly back to Ireland a few days later with her parents who had booked a holiday to visit. Upset about the disaster, but the departure date decided, they reluctantly left Japan. Hayakawa recalls that when she arrived back in Galway there was a welcoming committee waiting for her. Her friends were all concerned at what was happening back in Japan. Two days after returning, she joined Galway’s Saint Patrick’s Day Parade and marched with a sign encouraging her compatriots at home. As she marched with two Japanese friends, she recalls that other friends and well-wishers left the crowd to march alongside them. “People were dropping into the cafe with money for Tohoku,” Hayakawa says, remembering how touched she was by the show of compassion and solidarity. Over the next two months, Hayakawa, along with Irish and Japanese friends in Galway, raised ¥1.3 million (nearly €10,000) for the Japanese Red Cross Society. As well as Japanese food, Hayakawa has worked hard to bring other aspects of Japanese culture, from tanka poetry to computer gaming and animation, to the west coast of Ireland. Every year she helps out at the maid cafe at Akumakon, an anime and manga convention held annually at the National University of Ireland Galway. “This is what I mean by ‘Japanese food and more,'” she says, referring to a sign over the door of Wa Cafe. Hayakawa has gained in confidence with her extended stay in Galway. As with any restaurant there were setbacks, but she’s always bounced back, which she says is due to the support of friends and especially the community of chefs in Galway. What motivates me: I feel very happy when I see customers enjoying a meal, and when they keep coming back. It’s also great when customers come in for a special occasion like an anniversary, on a honeymoon or even their first day of college.